For seven years, Reece Watters drove as an 88M Motor Transport Operator for the U.S. Army. 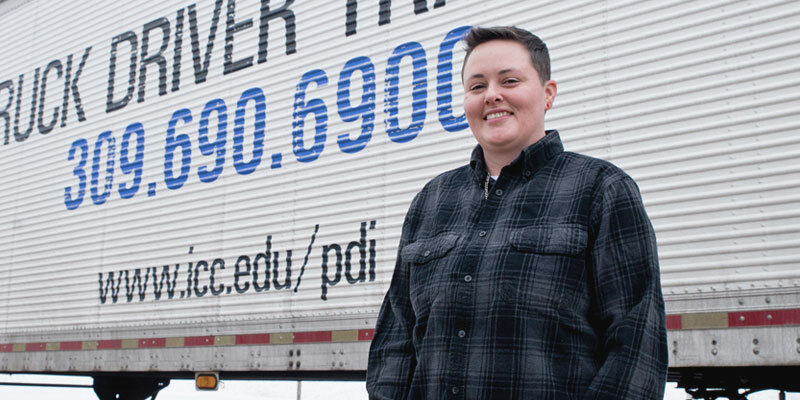 Now, it’s been seven years since she has driven large equipment and is getting back behind the wheel, retrained and certified through the Illinois Central College Truck Driver Training Program to enter the next phase of her life. Reece was in the military from 2005-2012 and served 15 months in Iraq as a driver. Riding in large convoys brought its own dangers, but the training and experience is starting to carry over after her seven-year break. “My training from being in the military was always watching out for everything around your truck, behind your truck, in front of your truck. You know, safety is the most important key and they stress that in this class and it was a big deal in the military as well. Safety, safety, safety,” Reece said. However, her years of military experience are being complimented by the atmosphere surrounding the Truck Driver Training program. A small class size allows for attention to detail and the instructors are there for her at every turn. Connie Smith, the Coordinator of the Truck Driver Training Program, not only sets prospective students up with the program, but also does outreach work to find where the jobs are so there’s no delay in getting hired. Reece is in her second week of the four-week program and her thoughts of the classwork and driving time are exceeding her expectations. With grants from the Veterans Affairs office, Reece’s only expenditure out of pocket is gas money for the commute and food and drink. Other than that, the course is covered and there are plenty of other grants and scholarships available for those attending the program. The high demand for truck drivers is at an all-time high, Reece is more than ready to take on her new career. To learn more about the Truck Driving Program at ICC, visit cce.icc.edu/pdi/truckdriver or contact Connie Smith at (309) 694-8555.